hiya, blog. it’s been a while. in december, i set some goals for 2014. somehow, it’s already february, and i wanted to check in about how i’m doing with them. here they are. i haven’t run since december 1st, when i totally rocked the seattle half marathon, finishing in less than two hours and blowing my previous PR out of the water. an hour or so later, my foot was killing me. my injury is similar to the injury i sustained at my marathon in april, except on the other foot. i’m not sure what is causing these injuries, exactly (my shoes? my stride? running on concrete and asphalt? undertraining? probably not overtraining), but i have been seeing a physical therapist, working on my strength, and cross-training by bouldering, lifting, swimming from time to time, and using the elliptical. at this point, my foot doesn’t hurt most of the time, but it’s still stiff and sore when i wake up in the morning, and i’m not ready to run again. i want to do recovery right, i.e. slowly — i think i said that last time, and then i got excited to be running again, and running fast, too. good metaphor, right? apply it literally to running a race. apply it figuratively to training for the race. to running in general. to the pursuit of just about any goal. so, i’m still training. still pursuing these goals. one way, if not another. see above. i registered for june’s smith rock ascent 50k before getting injured, but i’m pretty sure that particular race is not realistically in reach. in december, thinking my injury would heal quickly, i wrote out a long training plan and copied each run into my 2014 planner. every day or two i cross another one out. with any luck, i’ll be able to run the 15-mile race instead. when i’m back to running, i’ll recalibrate my goals. some possibilities: the mckenzie river trail run (september), the oregon coast 50k (october), the silver falls 50k (november), or the frozen trail runfest (december). i wish i had more time for this, but that’s not a good excuse. i am working with a graphic designer friend on polishing my branding, and hope to get a proper portfolio website together soon. i just set up my first google adwords campaign. i photographed an elopement last week. it was great. want to do more. i think i’m less than a month away from this. i’ve never lived alone before — i lived in dorms in high school, and dorms and shared apartments and houses in college and afterwards. i’ve been staying with my folks since i left california this past summer. soon i will have my own small studio apartment. my own kitchen. i mean, shared with ravi & anoushka, of course. i’m sure they will make themselves at home. 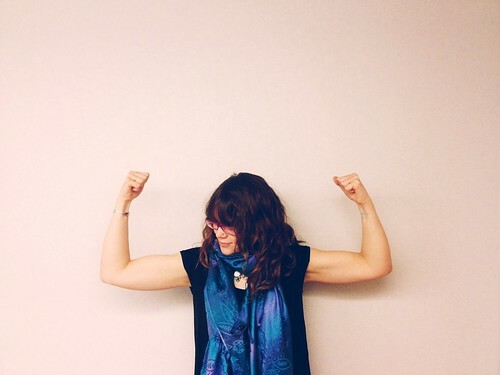 yup, i just put a picture of myself flexing my not-very-impressive(-yet) biceps on the internet. this is something i intend to do this summer. this is #&%!ing hard, but i’m trying.